Wow, something about the light through the tail of the bird in the first photo really grabs me. Lovely! That was my favorite part of the image too… The light was so brilliant behind him, but seeing it shine through those tail feathers is fascinating. So amazing, the colors of these little ones! What an amazing picture of this colorful hummer from underneath- beautiful. Thanks so much! It was so hard shooting into such bright sunlight, but what positives… Those glowing blue and green feathers on display! 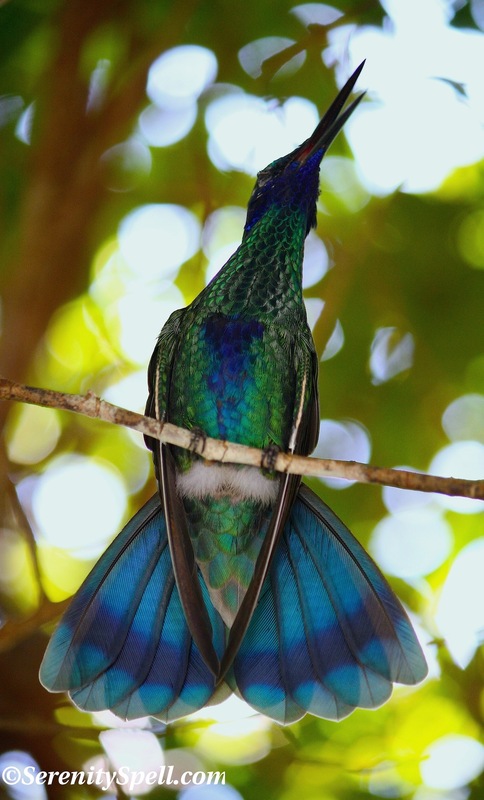 Your photos are lovely, the top one is fabulous – I love the shape of the tail and the iridescent colours, particularly. The facts are interesting however I’m always bothered about how the info is obtained. Usually by doing something dastardly to the bird so that our human curiousity can be sated. Maybe it’s just me, but that doesn’t seem right. I’d rather live my life not knowing so much and let birds live their lives naturally. Thanks so much — the sunlight was so intense, tough for a shot… But it shone through his beautiful feathers perfectly! VERY good point. As with all the Natural Kingdom, how they managed this information is dubious and troublesome. I’m with you 1000% on the leave-them-to-their-Natural-Order…. 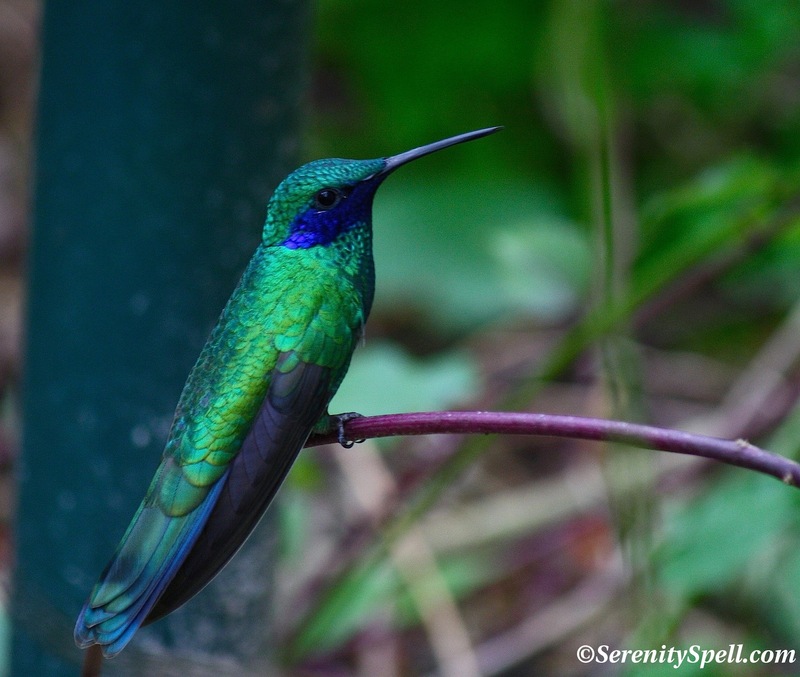 Beautiful – love the jewel colors:) Have a Great Week! Sometime since I came here. You *never disappoint! What a gorgeous picture! Brought many smiles to a dull day :))) Your description of the aviary as a fairy-like place, reminded me of a book on the senses by Diane Ackerman; in which she talks similarly of Monarch butterflies and their migration to the Trans mexican reserve. A natural history of the senses, is the name of the book. I MUST investigate that book by Diane Ackerman — “A Natural History of the Senses”; thanks for the tip! Thanks so much for sharing this little beauty! Thanks so much! I wish we had them in our area — they’re a rare sight, unfortunately. Thanks so much! I was lucky to snag him in all his glory… 🙂 We actually don’t have many (any?) where I live, either — this was shot at an aviary (the largest of its kind in the States, so I’m happy to live nearby!). But you’re right… They ARE quite similar! What a lovely bird! How do you do this? this is absolutely amazing and gallery worthy! I’m jealous !!! Aw, you’re exceptionally kind!! I was thrilled to have caught this beautiful little guy… But I’m shocked it even came out! I was on my tiptoes, the bird was deep in the trees, mixed up in the branches, the sun was blinding — so I’m just happy he’s even visible, heh!! And the lighting is just perfect, highlighting his tail. Serendipity then. Exactly. 🙂 Thanks so much, again! You’re very kind. Striking photos! What beautiful birds! Thanks so much! Their colors are truly otherworldly. I was really lucky — I was on my tiptoes, the bird was deep in the trees… I’m shocked the image even came out, heh!